I, for some weird sentimental reason, never ask the name of the movie I am singing for. I eventually find it. And yes, I have missed a lot of work like that. I think its something that started off with Kannathil Muthamittal. I did not dare ask the name. I was just too plain damn scared to say or ask anything to either Rahman sir or Mani sir. I was seeing my dream play out and the person I had worshipped all through was right in front of me teaching me how to sing. And anyway, at that time, I had no clue whether I would ever find my name in print on the cassette. And I do not ask voluntarily, unless I find the name of the movie on the lyric sheet. Or I somehow guess. And now that I work with Aahaa FM, sometimes, I get to see the Audio CD before it hits the market. And This is the one thing that took me completely by surprise. I had no clue I had sung in the Delhi 6. I had no recollection either. And have been waiting to hear the song to figure out what this song was, ever since last week when people started wishing me the best. And some sent me the links where the track listing was given. That I did not remember an Ash King did not help either. But as soon as the song opened bells of recognition pealed. I have sung only about 3 lines in the song. And I did not expect to see my name on the CD at all. Ash King, (I don't know if that was how he introduced himself then) is from London. I hear he is pretty popular there as an R&B artiste. I remember being awestruck during that session - the utmost patience with which Rahman sir gets a someone to sing. So much encouragement and I really wonder where he sources his zillion tonnes of patience. Every recording session is not just learning a song that has never been sung. Its a life lesson. More so at his studio. There is so much to learn. You realize there is so much evolving to do after every visit. One can never cease to be part an experience that will always be nurturing, humbling and divine. Every time you sing. At His studio. P.S. : This is wishing for you, that may you have enough opportunities that will give you immense joy and a sense of......... like when you close your eyes and your face is illuminated by the flicker of a beautiful smile. May you have enough things cross your path that make you smile to yourself and light up your days. There will be times that you will feel like hugging the entire Universe. Make sure you identify it. Revel in it. May your work adore you and may you adore the work you do. May you be loved. Totally. Completely. By the entire Universe. Thathaastu. Missed you 'wishing' part at the end of your entry. :-). Anyhow here is me wishing me that you get many more such chances that help you learn more to quench your thirst for knowledge. Be kind enough to impart the knowledge to others too! just today,i had written two comments about this song as responses to ur previous post..
good to see u talkin about it urself mam..thank u! "Kyun Goonj Rahi Hai Dhadkan..."
I loved it Chinamayi; mesmerized by Rahman's spell again. Great song! interesting to read your blog. Keep it coming. Just heard your song... well a 2 line song you can say... beautiful! Keep it coming! All the best. kyon goonj rahi hai dhadkan teri awaaz sunkar!!!!!! எங்களுக்கு திரைப்பட பாடல்கள் மூலம் ஒரு நிம்மதி கிடைக்கிறது என்றால், அதற்கு பின்னால் உங்களைபோன்ற இசைப்பறவைகளின் கடுமையான உழைப்பு இருப்பதை உணரமுடிகிறது!! வாழ்க! வாழ்க!! உங்கள் புகழும் நீங்களும் உயர வாழ்த்துகிறோம்! !!! ipdiyum oru sentimenta..examla answer ezhutharen..kostinum teriyum aana subject name paaka mattengara mathiri iruku :D aana ipdilam sentiment vachiruntha cutea thaan iruku.. So I am probably your biggest fan, right from your sapthaswarangal days and first jingle songs in "anbulla snegithe" and I feel like kicking myself for JUST discovering your blog! Better late than never i guess, iv been reading some of your entries and they are truly hearfelt and inspiring just like your music, looking forward to reading all your future entries! 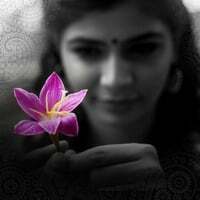 Take care chinmayi! Your biggest fan ever!! Ramesh from Singapore. Nice Chinmayi! Looking forward to listen to this song, will do so soon! And needless to say ARR rocks! All the best for your future endeavours! I listened to the track today - such a good track - 3 lines doesnt matter - u sound so sweet. I am very fascinated with your blogs and your hosting abilities. I watched the super singer’s episodes in Canada and they were superb. Your writing is very inspiring and I think you are a great role model to many. I have been listening to this song for couple of days and didn't know that female artist i.e. you have sung only 3 lines. They fuse so well with music that even those few lines make song turn for best. Very well sung. Keep it up. I heard this song. First I could not recognize that there is a female voice in there. Your voice is so blended with the music. ARRehman finds even the smallest possible opportunity for you to recognize your talent, by giving you opportunities wherever possible. You should definitely have some very good experience working with ARRehman that you could share with us. I always used to admire ARR on his compositions and his mannerism. Tell us some of your interesting and most admirable experience that you had when you were working with him on a song compositions. What were the learnings that you had? Can one translate this song to english for me? Pls? I 1st heared this song in a taxi cab here in the netherlands....I never listen to indian songs...but this was a weird kind of different song. Love it. Chinmayee: I just absolutely *love* Dil Gira Dafatan, and you are indeed blessed. Many congratulations on the fine performance. Look forward to hearing more of you in Hindi movies. @Anonymous: I have translated the song at my blog, at this link. The song is awesome! Way to go Chinmayee! I wouldn't have ever dreamed of finding a first hand experience of working with Rahman! Thanks! Hope you can continue sharing your experience in the music industry with us! Hi Chinmayi ... hats off to u for Dil Gira Dafatan .. the entire world has to take a bow.. for that fantastic few lines.. It was magical to say the least. It feels so nice hearing this song and your singing. Hearing this song,we kind of feel so nice about the entire universe around us... its all so beautiful. Beautiful Song and you have a sweet voice!! btw...is that you who sung "Mann Chandre" for Rahman sir's album "connections"? As told by Rahman sir, you keep surprising and mesmerizing us, so I guess its your voice. NOTE: beautiful choice of words. Pearls got formed in shell in the sea. seen. meaning - the girl is smiling. Prasoon does Gulzar proud. ghazals are affecting those other songs also. "Music does not figure in this column as this space is too frivolous"
And suddenly Dance, Food, Books, etc..and last but not least Movies, fall under the frivolous category. Anyways, search for "Dil gira" led me here. You were amazing in that song. Keep up the good work!! I can hear ur "Dadkan" after seeing ur name.. The child like charm is keeping u up.. Good keep going.. I wanted to ask you one more thing. I know u r from Sapthaswarangal. But dont remember seeing u in it.. Do u have any clipping of those days. One thing I remember is when on a Diwali (i think 2001) day the aspiring singers got opportunity to sing to playback singers. Did u sing with Srinivas.. I would like you to write about it in your blog. Nice to know your experience with ARR sir.